The Samsung Galaxy S II is certainly one of the snappiest smartphones around, but there’s no such thing as a too fast CPU. That’s why the XDA community stepped in and pushed the clock speed of the CPU of the T-Mobile version of the smartphone to the mind-blowing 1.8 GHz. The exact CPU frequency that was achieved is actually 1.836 GHz. The kernel used to achieve this kind of speed is publicly available and you can try it on your Galaxy S II, if you dare. The detailed instructions on how to flash it can be found by following the source link below. As usual with such custom kernels, proceed at your own risk and know that if something goes south, you are on your own, as you warranty will be voided. If you do bring your dual-core CPU to such frequencies though, do not hesitate to share some of those benchmark scores with us in the comments section below. 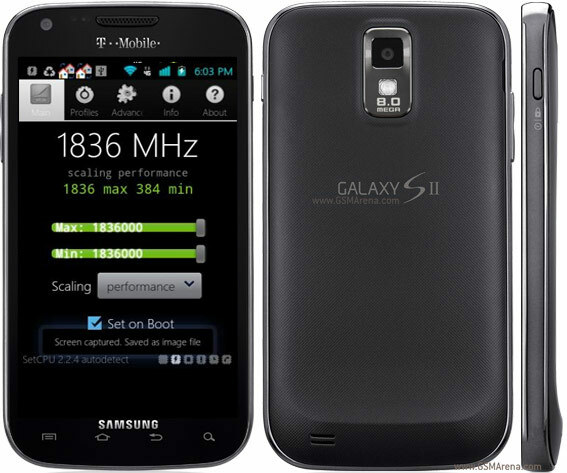 The bad news is that the T-Mobile version of the Galaxy S II uses a chipset different to all the other models, so there’s no easy way of porting this one around.